Aerodynamic styling with a Quick Click Fixer attachment. Includes all parts required for mounting to one bike. 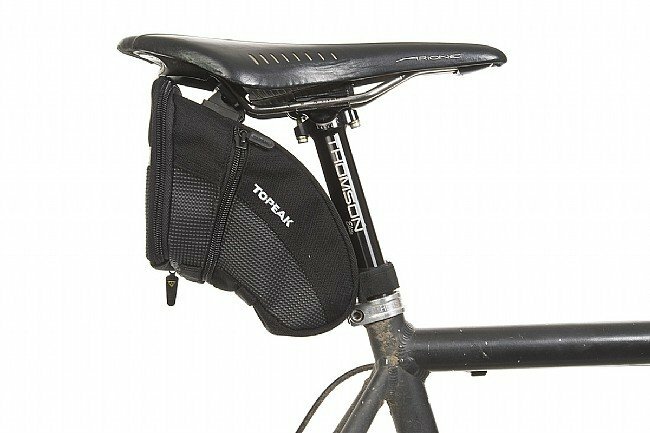 With an extra Topeak Fixer Saddle Rail Mount (sold separately), the bag can quickly be moved from bike to bike. Very good bag! It's my third one! Awesome bag! Carries everything we need when riding. I also installed a tail light on the door. The bag is very easy to install and holds a good amount of necessities. In fact, I'm getting ready to purchase one more for another bike. I have a road bike, mountain bike, 29er, and Fat Tire Bike. I have used different sized bags on each bike. I am amazed at the comments about the clips breaking. I have never had one break ever and have crashed on off road biking more than once. The only way that the clips could break after 4 or 5 rides is they were not installed correctly or did not fit the seat correctly? My only complaint is the zippers do wear out, but what zipper does not. I am probably guilty of putting too much in them which probably is why the zippers break. Don't change anything on these bags. I already have this same bag. I bought a second one for son's bike. This allow you to move the bag to other bike with little effort. I use all of the three different sizes on my bikes. I am a serious rider that puts lots of miles on road bikes, mountain and 29ers. I like the fact that they are so simple to install and just as easy to take on and off your bikes. They are very durable and last a long time. I am amazed at the reviews where people complain that the bag fell off or the clip broke. If the clip broke it was because it was not installed correctly on the bike seat, and if you had the strap attached on your seat post correctly it could not fall off even if your clip broke? If your clip assembly did not fit the seat why would you try to use it? I have 5 different brand of bikes and seats and these fit all of them great. I am very happy with this design and will continue to use them. Good quality bag. Just the right size for carrying essentials. Brought it home. Very excited to mount and go for a ride. Totally disappointed to find that the F11 Fixer bracket is an awful fit for the narrow rails of my San Marco seat. You could force the bracket to attach, BUT I HAVE NO DOUBT THAT MANY OF THE COMPLAINTS OF BROKEN QUICK CLICK BRACKETS IS BC FOLKS ARE TRYING TO FORCE THIS BRACKET TO FIT THEIR NARROW SADDLE RAILS AND ONCE THEY TORQUE DOWN ON THE SCREWS THE PLASTIC CLIP IS DAMAGED. 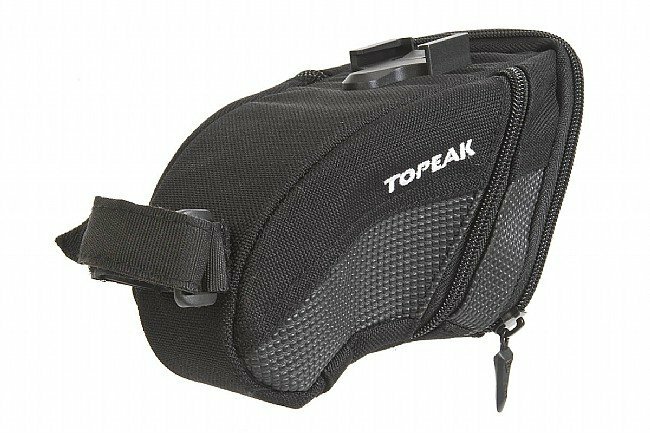 Really wish Topeak made a more prominent point of this sizing issue on the product packing. 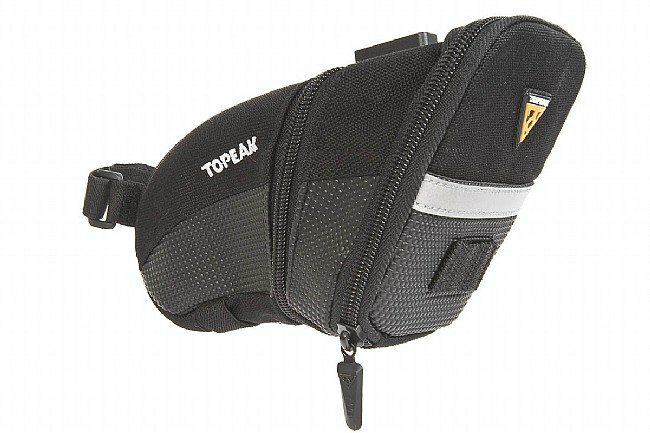 Better still, wish Topeak offered the bag in two Quick Click sizes. 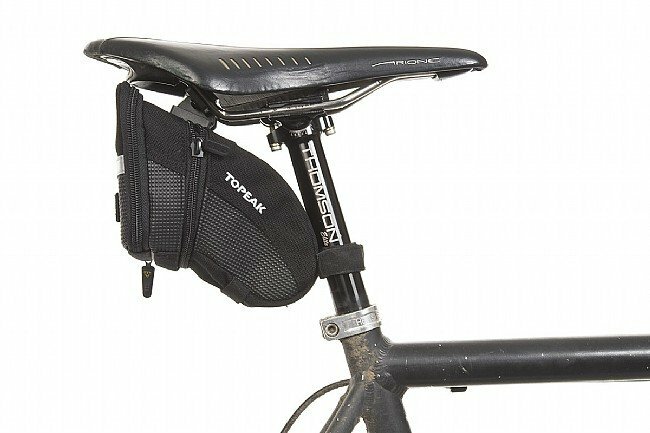 A previous reviewer said that there is a F22 Fixer Bracket that Topeak sells that provides a better fit for narrow rails. But what a BUMMER to have to spend more money and time before getting to use this product without breaking it! wish i read the reviews before I purchased this pack. The quick click mounting clip broke the 4th day I had the bag. It occured in the middle of a 10 day bike tour. The bag itself is nice, holds a lot of stuff and is expandable. Elastic straps on bottom will hold a micro pump securely and the tab on back is a nice mount for a rear flashing light during commutes. The bag is great the quick click clip is junk. Buy the strap version. The pack is well designed. The quick release clip works well but the screws supplied for attaching the clip to the seat rails were too short, I had to go and buy some longer ones so I could attach it. I purchased the small, good for two tubes, inflator, 2xtire levers, 3x CO2, patch kit, small multi-tool, car keys & beer money. The bag is a nice design but the attachment clip leaves a lot to be desired. I love the medium pack. It fits my bike well. I have one on all of my bikes. Well Built. Zipper seems durable. The quick click connects the bag to the bike securely and makes it easy to remove. 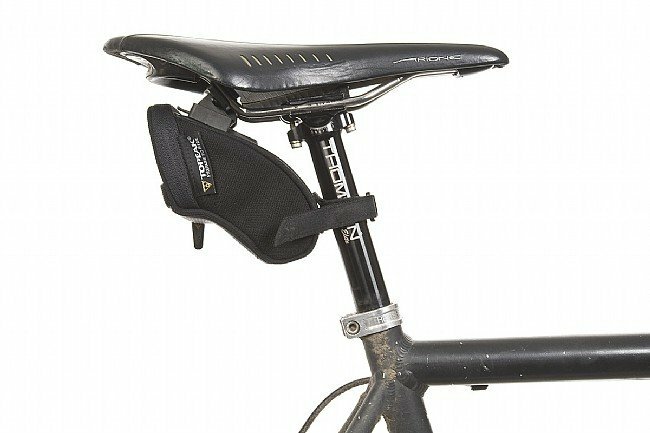 My only slight complaint is that even with the quick click tab mounted all the way at the rear of seat rails the bag is pressed against the seat post without enough room for it to fully expand. The expansion zipper won't do me much good. A pack for all of your needs. Excellent product. Well built, very durable. Be sure to get the right size. Small is more than adequate for 2 tubes, irons, patches. Etc. Great product and if you have the Quick Click fixer attachment for other bikes it is simple to transfer pack from one bike to the other with no hassle.